This is a copy of my response to the consultation on Bill C-32, Canada's copyright reform act. Details and links to other responses can be found on Michael Geist's blog. Comments are due by January 31. Speaking as a scholarly author/creator, student, teacher, and librarian, here are my comments on what I see as the most critical aspects to consider with Bill C-32. As Bill C-32 stands, circumvention of digital locks would be illegal, even if the use of the material is perfectly legal (e.g., private copying, making works accessible to the print disabled). This is a deeply troubling provision. There is no protection at all for authors such as myself who share our work freely on the Internet. What is to stop someone from putting a lock in between my work and those who would like to read it? My point is that if there are to be any provisions regarding digital locks, these should limit placing locks which circumvent legal use. If anyone places a lock on work that I have made freely available, the law should protect my right to share, and my reader's right to have the lock removed. Facilitating legal use should be REQUIRED, not just permitted. Selling digitally locked down materials that effectively prevent use by the print disabled is a practice that deserves to be outlawed, not protected! Canada is far behind other countries such as the U.S. when it comes to sharing material for educational purposes. Canada's educational systems spend a great deal of money on materials covered by copyright, and this will not change with expanded fair dealing. It is in the best interests of creators to support education; without basic literacy, for example, there would be little need for written material of any kind. Like many in today's society, I have contributed Creative Commons licensed photos for free sharing to flickr, and occasionally participate in free collaborative services such as the Open Access Directory and Wikipedia. Access Copyright Insanity - Possible Solutions? Access Copyright, Canada's copyright collective, is asking for an absolutely ludicrous tariff increase (about a tenfold increase from about $3.5 to $35 per post-secondary student), at the same time that they are looking for increased restrictions (no linking please!) and paperwork (e.g. having students sign a form saying that they are in fact a student, and using the work for their studies). This is all on top of libraries paying top dollar for the content, by the way. Ask Access Copyright for a complete list of members / works covered. Don't buy any of their stuff. Who doesn't have way too much to read as it is? Besides, this will filter out anyone so out of touch that they think forbidding hyperlinking on the internet makes sense. If you MUST buy their stuff, set up a separate site on your website for this material, appropriately labelled - perhaps with an icon including a hefty lock and chain and/or wording to the effect, USE THIS LOCKED DOWN MATERIAL AT YOUR OWN LEGAL PERIL. Send Access Copyright a bill for about 10 times what they think you should pay them. This actually does make sense for a university library; think of how many faculty and students are creators, particularly of works in the academic library. Why are WE paying THEM at all, anyway? Another thought: if Access Copyright members have issues with people reading and citing their work, what will this do to the Open Access Citation Impact Advantage? My prediction is that this will increase the difference. On the plus side, we should all be grateful to Access Copyright for demands that so obviously show the lunacy of lock-down in academia that faculty members are now flocking to solutions such as Open Educational Resources. Paul Peters of Hindawi reports that Hindawi exceeded 3,000 monthly submissions for the first time in December 2010, up from reaching 2,000 monthly submissions for the first time in August 2010. Overall, growth in submissions for Hindawi was 40% in 2010. Congratulations to Hindawi for yet another indication of The Dramatic Growth of Open Access! This post explores data strongly suggesting that open access journal PLoS ONE is now the world's largest journal. According to Pete Binfield (personal correspondence), in 2010 PLoS One published 6,749 articles. Based on listserv discussions in 2008, the world's largest journals at that date were PHYS REV B (5782 articles) and APPL PHYS LETT (5449 articles). As of today, a search for 2010 articles at the APS website yields 6,206 articles. A search for 2010 articles for APPL PHYS LETT in IEEE's xPLore service yields 4,381 articles. So it is timely to raise the question: is the world's largest scholarly journal now an open access journal, PLoS One? If anyone has data that can help to illuminate this issue, please join the conversation started by Daniel Mietchen at Friend Feed, or send me an e-mail at hgmorris at sfu dot ca. 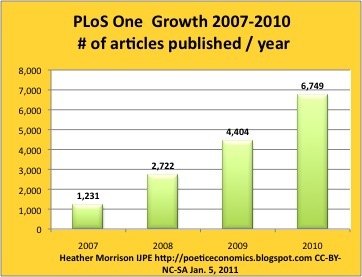 Update January 21, 2012: since this post was written, in 2011 PLoS ONE growth doubled, to just under 14,000 articles published in 2011 alone. Details and chart available in the December 31, 2012 issue of The Dramatic Growth of Open Access. Methodology Note: this post is an informal brief research project, based on consultation with library and publisher experts on the size of the world's largest journals, presented for informal peer collaboration and academic critique. It is also an update of this post from 2009 projecting PLoS ONE as the world's largest journal in 2010. 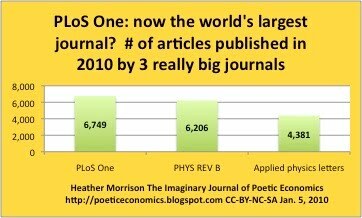 The number of articles published in 2010 in PLoS ONE is less than projected, but still apparently more than enough to make PLoS ONE the world's largest research journal. This post forms part of the Dramatic Growth of Open Access series.